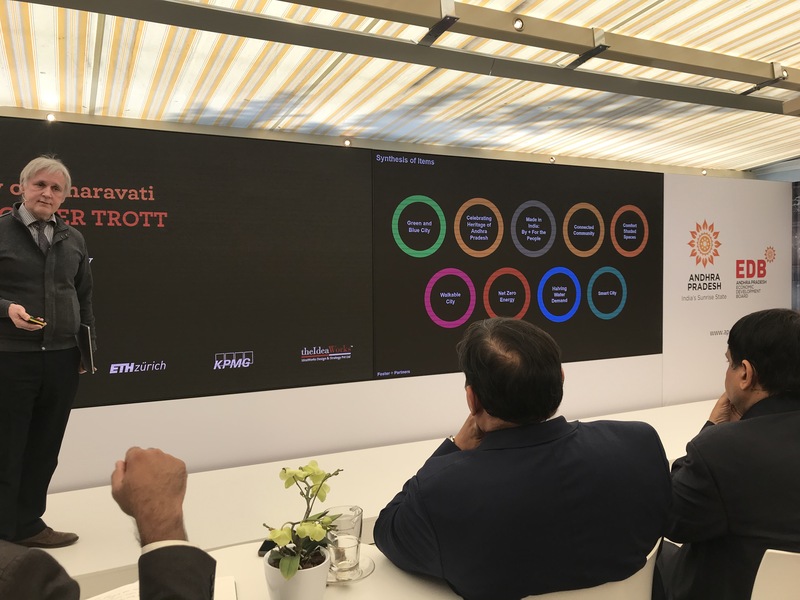 Despite a focus on the billionaire attendees at Davos and the accompanying cynicism, there is a group of participants who attend the World Economic Forum because they care about the state of the world and seek to make an impact. I am among them. As places to network and meet interesting people go, it doesn’t get better! Two years ago I made a leap of faith by boarding a plane to Frankfurt, meeting up with Motivate2B founder, Thomas Juli to head to the World Economic Forum. 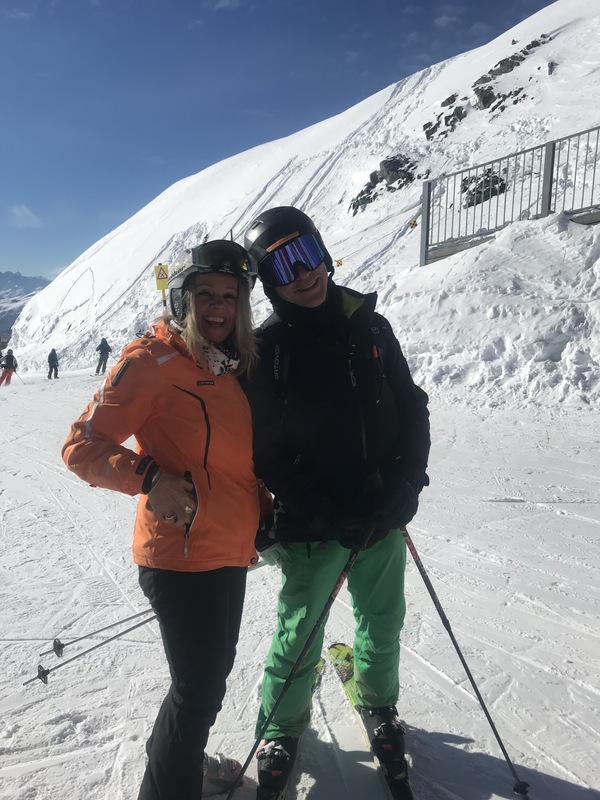 After a day on the slopes at Klosters, Switzerland we test drove a beta version of a workshop with volunteer participants’, then headed to Davos, home of the World Economic Forum, to attend the open-to-the-public-forums. It was at a forum on mental health, with Matthieu Ricard and other panelists where I learned the high suicide rates due to depression and anxiety globally. The leadership consciousness program for VR/AR that I’d been working on roughly since 2008, pivoted to address this issue. I’m still working on raising pre-seed funding for a prototype now; two prototypes actually, in order to reconnect from being disconnected. Turns out my notion of replacing stigma with empathy via immersive live VR is a hard-to-convey concept best experienced to absorb and validate its potential. 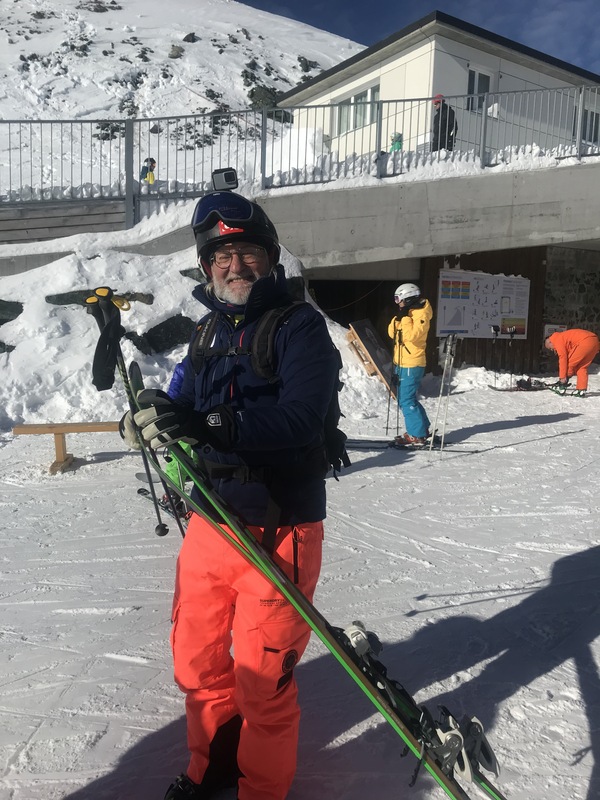 This year, I boarded a plane for Zurich, joined Peter Stevens (Scrum coach and Personal Agility founder) for the drive to Davos then the rest of the larger group, once again ably organized by Thomas. Most stayed in Klosters; I was in Saas which is a bus or car ride down the road. Chronologically, here’s what happened. 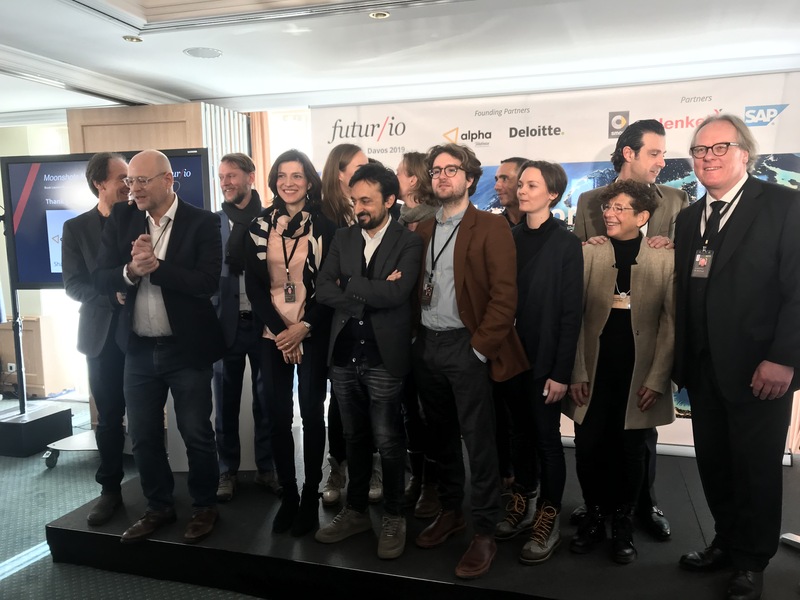 The Human Business Architect’s team is comprised of Thomas Juli of Motivate2B, Sabine Schwind von Engelstein, and Christipher Weber-Fuerst of The Future is Feminine. Each brings something unique to the equation. Rendezvousing at the top of the ski area Parsenn we were asked questions that explored: Who am I and why am I here? What difference do I wish to make? On day two, when the light went flat and you had no idea whether you were about to hit a bump, the mountain mimicked full-on VUCA (volatility, uncertainty, complexity and ambiguity) conditions. A lot of uncertainty about what was coming up, and a need to be fully present in the moment. It was a great opportunity to use what showed up in the environment to be fully present with each step. For more information on Human Business Architects click here. Climate Change and Conflict: The Challenges Ahead with Hadley Gamble, Anchor, CNBC (Moderator), Peter Maurer, President, International Committee of the Red Cross, Nicholas Kristof, Op-Ed Contributor, The New York Times. The Art of New Business: Body, Mind and Soul of Digitization moderated by Shelley Zalis, CEO, The Female Quotient. 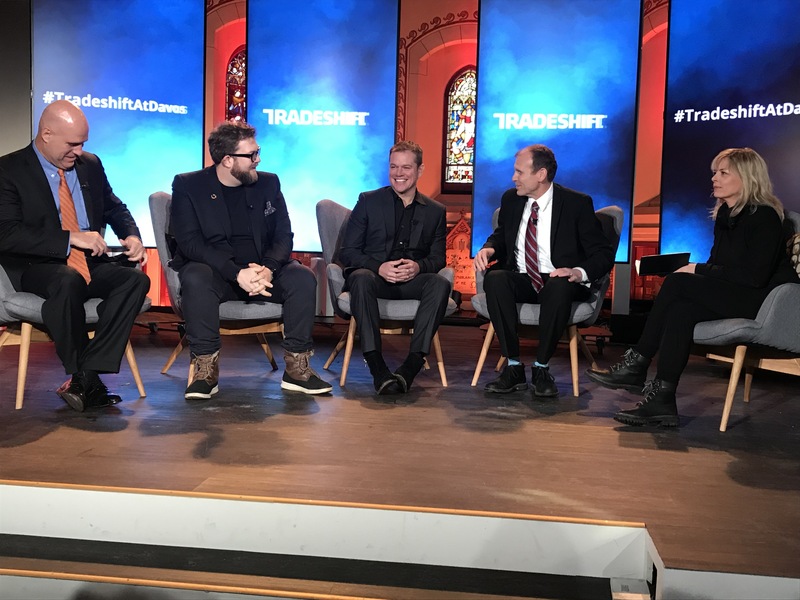 Panelists: Barbara Bulc, Founder and President, Global Development and Ambassador, Reboot the Future; Hans Reitz, Co-Founder, The Grameen Creative Lab; Harald Neidhardt, CEO & Curator, futur/io; Thomas Juli, Co-Founder and Human Business Architect and Managing Director, Motivate2B. I missed the early morning sessions I was aiming for since my transport was too far out and all was delayed on a very cold day. The one on leadership consciousness would have been insightful just to see how others are positioning their work. In the spirit of open transparency, I did frequent Wipro’s hot chocolate and waffle truck several times a day. At -20C or so, it seemed like a good idea and the team serving WEF participants were always friendly. Dark hot chocolate. Did I mention that? The other venue hosting events of interest was Tradeshift’s Sanctuary on Davos Platz. The two I caught there, missing Adam Grant in the process, was Conscience at the Edge of Capitalism and Opportunity at the Edge of Crisis with Matt Damon and Gary White, co-founders of Water.org with the CEO and co-founder of Tradeshift Christian Lanng, and Tony Milikin VP Procurement & Sustainability Europe at Anheuser-Busch InBev. Out of all the sessions I attended, the Water.org session and the climate change conversation offered insight. 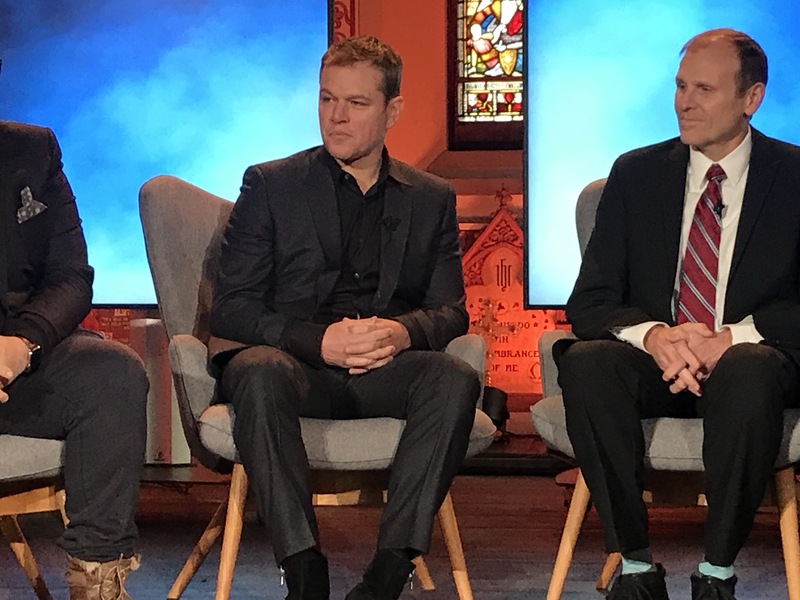 Water.org’s conversation was largely led by Matt Damon (Gary White sits on his right) whose story-telling fit his profession… his experience talking to kids who spend four hours a day gathering water was heart-opening and a valued diversion from the usual heavily intellectual emphasis. I listen for insights. This one offered a lot of insight into the systemic effects of fixing access to water on girls getting an education and the impact on society. Only thirty minutes in length but a touching thirty minutes. 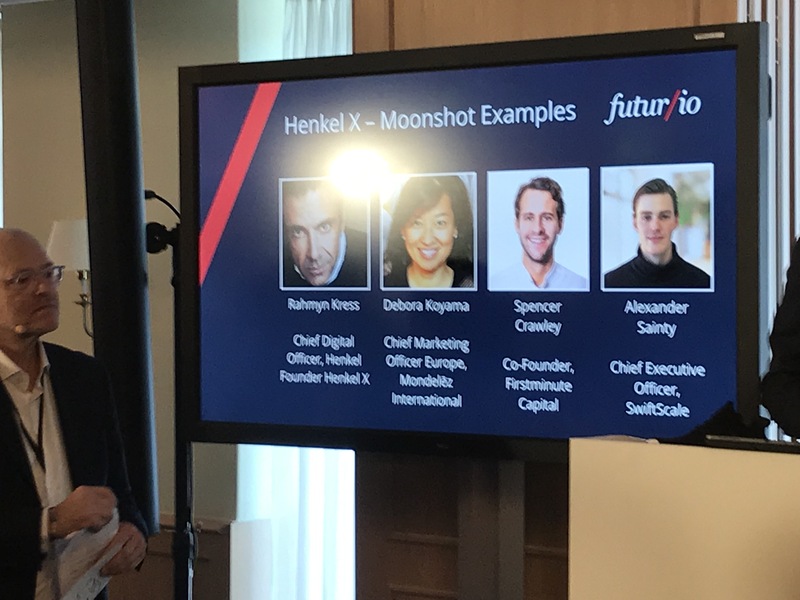 To get into Future.io you have to know someone who knows someone. That’s the ticket to enter hotels with restricted security passes. The application is done well in advance and the badge is there for pick up when you register. 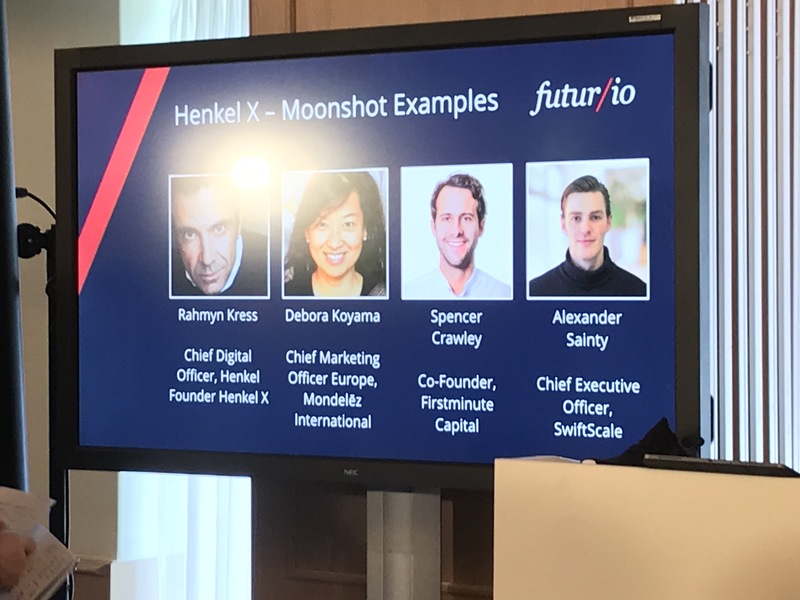 Moonshots for Europe is the brainchild of Harald Neidhardt who successfully rounded up a host of high-level corporate sponsors. The launch took the morning featuring panels of speakers working in innovation. Their book, produced much the same way we produced From Hierarchy to High Performance, was distributed. 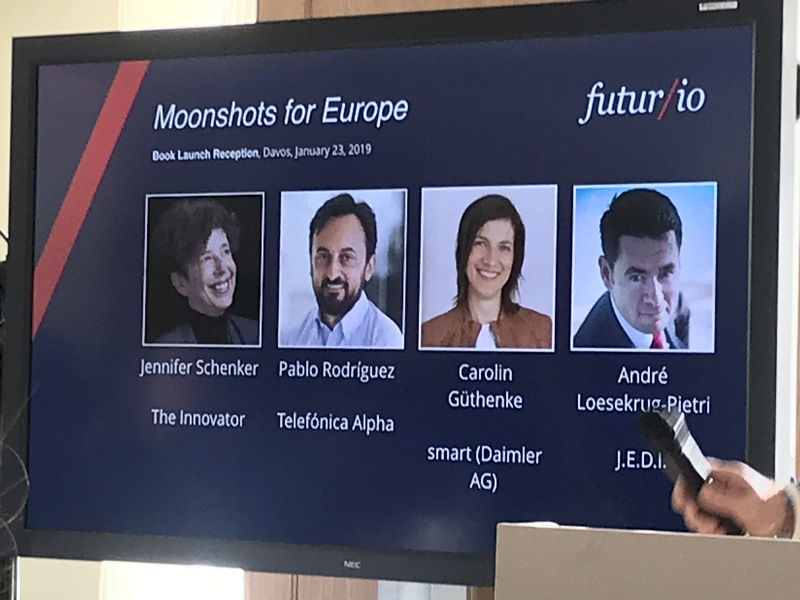 Moonshots for Europe speaks to a call that I believe Canada must consider as a Nation to adopt the mindset needed to shift from complacency to remain relevant to society and viable economically and ecologically. While I applied ahead of time to attend the Spotlight on Global Access to Healthcare it was full so the one session that might have informed my tech project wasn’t accessible. 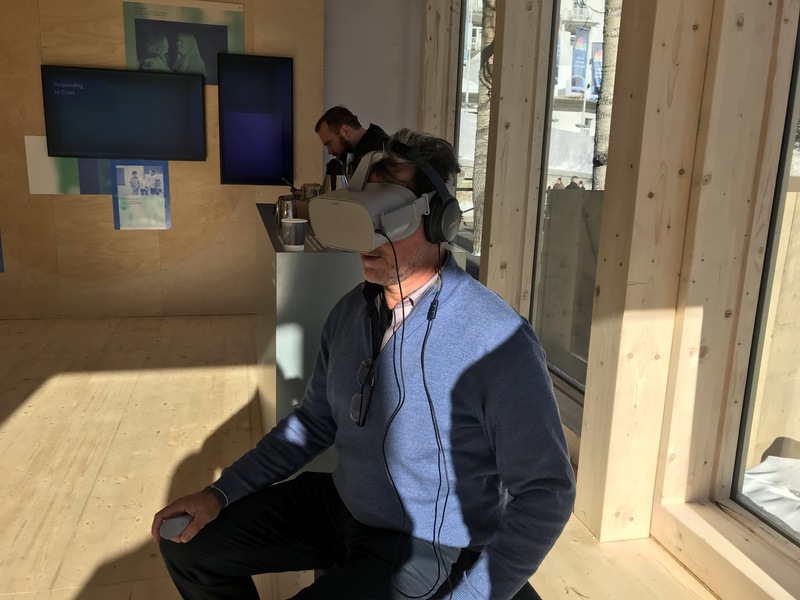 The Facebook Pavilion had an Oculus demo as it did the last time. The pavilion is not a permanent structure. It goes up the week before Davos and down the week after. You would never know it. Colleague and friend John Thompson is trying on 360 live immersion film for the first time. 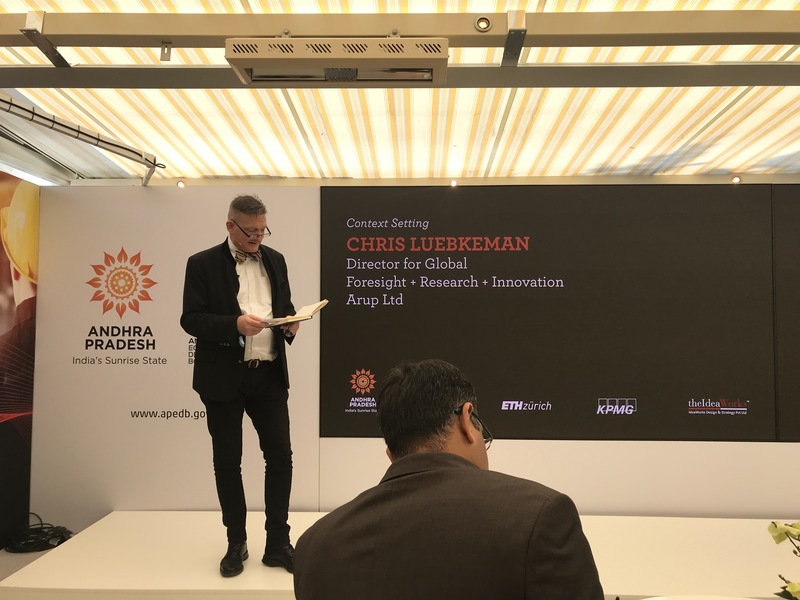 Finally, the Andhra Pradesh presentation on mega-cities was very interesting largely because it spoke to the freedom to design a city that works. 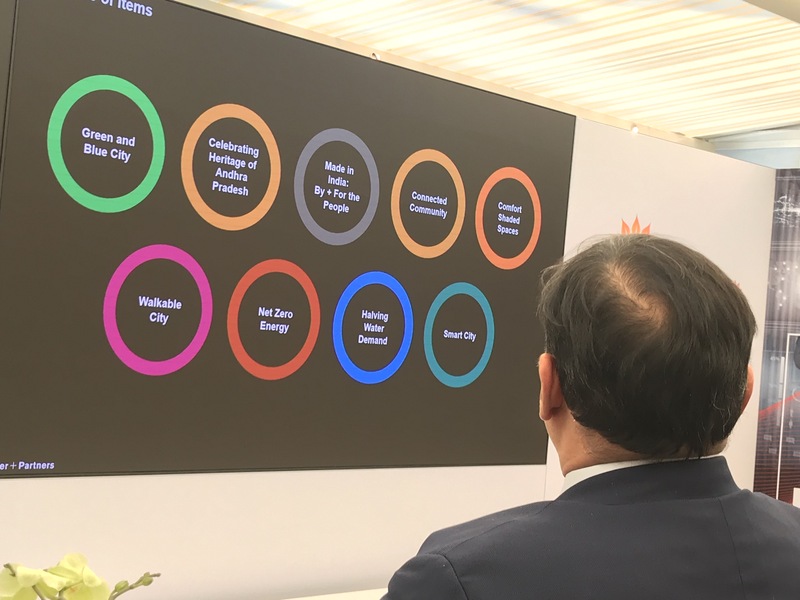 The entire design team was in attendance supported by a lovely interactive panel that demonstrated the statistics behind mega-cities which house the bulk of the human population. 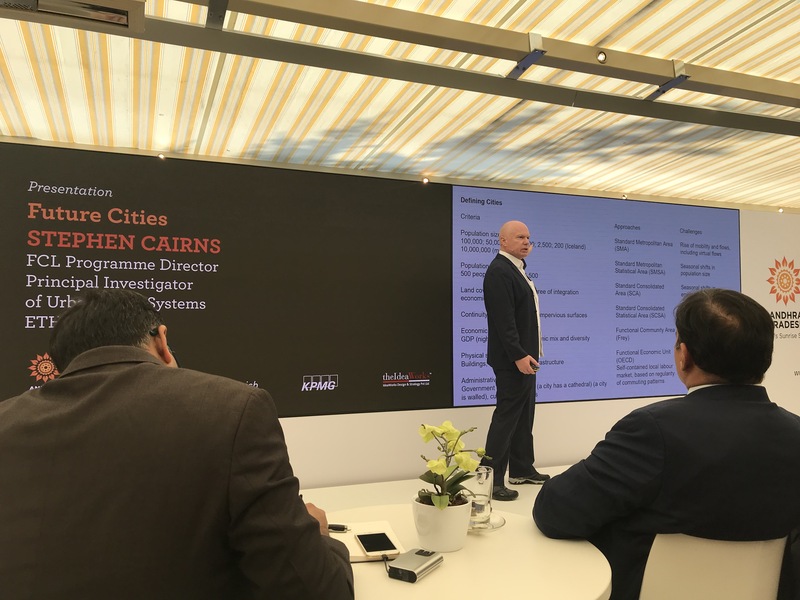 Ably moderated by Chris Luebkeman, speakers walked us through the development of a mega-city designed to sustainably hold a large population. The presentation was followed by an outstanding Indian buffet. 1. Book your accommodation now. You might get space in Davos (depending on your budget) but otherwise best to look at nearby communities where the WEF shuttle runs and/or served by trains. My location the bus quit at 7:20 pm out of Klosters so if I wanted to get to my accommodation I either had to have a car or pay for an Uber (50-70SF). 2. Start researching what will be on the program, who you know can support you getting into the event, and pre-register. I pre-registered for Russia House and Ukraine House. When the Russia House program was revealed the sessions conflicted with better sessions elsewhere. Ukraine House had great sessions. Pre-registration is a good idea. 3. Arrive a day early because it takes a while to absorb the magnitude of the event. And it will give you time to see what you do want to attend plus find the hot chocolate truck. 4. For Open Forum or any public events arrive early. It’s first come, first served. 5. Allow time to explore the area. You can ski right above Davos on Jacobshorn or out of Kloster. Kloster’s Koffee Klatch is a wonderful apres ski just beside the ski rental and parking lot. In Davos, take the funicular to the Schatzalp where you can enjoy a glass of Prosecco and spectacular view from their ice bar. 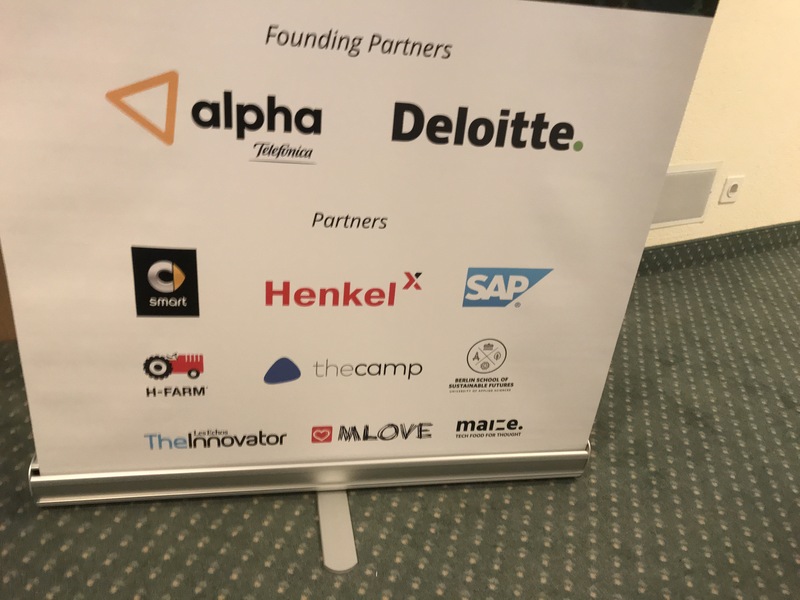 Finally, a major shout out of gratitude to all who participated and to Nuria Rojo and Andreas Lagger who organized a HackingHR with me (Dawna) event in Zurich prior to Davos. A wonderful group. Great to see old friends and make new ones.